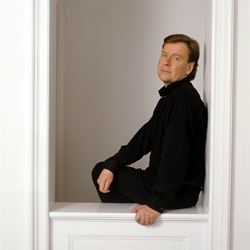 The music of Magnus Lindberg has offered the orchestra with which he has worked for several years its most authoritative moments. For the first collaboration between Agora and the Radio France Philharmonic Orchestra, Joy for an ensemble augmented with a synthesyzer and a sampler, rubs shoulders with the latest orchestral work by the Finnish composer. In celebration of architect Frank Gehry's design for the new Los Angeles Philharmonic Center, Sculpture is based on strong polarities, reoccurent fanfare signals, and a powerful harmonic line. A Radio France, IRCAM-Centre Pompidou co-production. Sponsored by the SACEM.